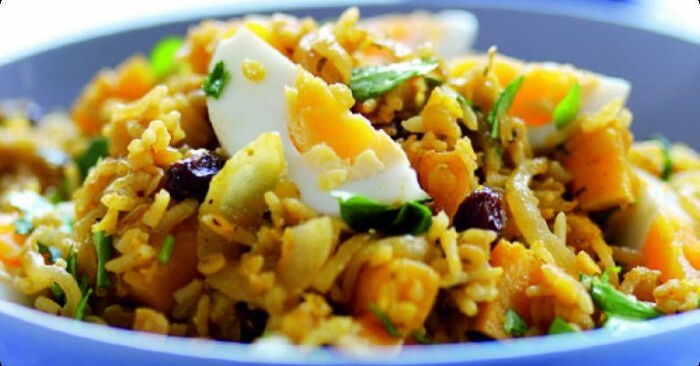 Economical, tasty and easy to prepare. There’s no need to peel the butternut squash - the skin becomes soft enough to eat during cooking. Just give it a good wash before you start. Follow a recipe; follow food safety & hygiene rules; use measuring spoons and cups; use balance/digital scales; use a jug to measure liquids; chop using bridge/claw safely; snip herbs with scissors; use a box grater safely; crush garlic; use the hob (with adult supervision). Knife, chopping board, grater, garlic crusher, measuring cups and spoons, weighing scales, scissors, jug, large lidded saucepan, wooden spoon, medium saucepan. Heat the oil in a large pan, add the onions and sauté for 4-5 minutes or until golden. Stir in the garlic, ginger and butternut squash and sauté for a further 2 minutes. Add the curry paste, rice, lentils, raisins and stock and bring to the boil. Cover and simmer for 10-15 minutes or until the squash and rice are tender. Meanwhile, place the eggs in a medium pan, cover with water and bring to the boil. Simmer for 7 minutes. Drain the eggs, then rinse in cold water. Tap the shells all over and peel away. Cut the eggs into quarters. Remove the lid from the rice and give it a good stir - most of the liquid should have been absorbed by the rice. Adjust the seasoning, stir in the coriander and eggs. Cover again for 1-2 minutes to heat through the eggs before serving. 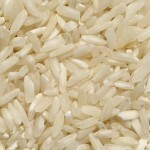 Rice provides starchy carbohydrate, which gives us energy, and is a good source of fibre, and B vitamins. Lentils are packed with protein and fibre. They are also low in fat and contain a number of substances which are thought to be hugely beneficial to our health. 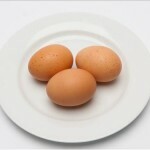 Eggs are an excellent source of protein, vitamins and minerals. Protein is essential for building and repairing our bodies..